WASHINGTON, Oct. 31 (Yonhap) — U.S. Secretary of State Mike Pompeo said Wednesday that he will meet with his North Korean counterpart next week to continue talks on the denuclearization of the regime. Speaking on the radio show The Laura Ingraham Show, Pompeo said the two sides will discuss the issue of letting international inspectors into North Korea’s nuclear and missile sites. North Korean leader Kim Jong-un told Pompeo during the secretary’s trip to Pyongyang earlier this month that he would invite the inspectors to verify the Punggye-ri nuclear site’s dismantlement in May. South Korea’s state spy agency was quoted as telling lawmakers Wednesday that North Korea appears to be preparing for a visit by the experts. The second site the secretary referred to is likely the North’s missile engine testing facility in Dongchang-ri, which Kim committed to dismantle before outside inspectors during his summit with South Korean President Moon Jae-in last month. 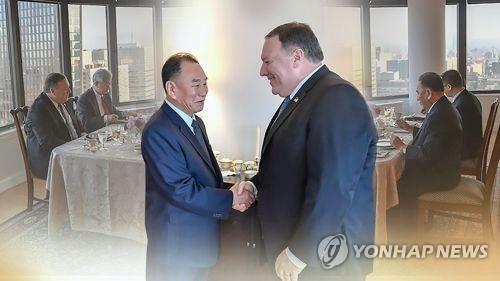 Multiple diplomatic sources told Yonhap earlier that Pompeo plans to meet his North Korean counterpart in New York around Nov. 9. It’s still unclear who the North Korean official will be, but Kim Yong-chol, a top aide to Kim Jong-un, has been cited as most likely. The two met in New York in May after Trump called off a planned summit with the North Korean leader. That meeting and Kim Yong-chol’s subsequent visit with Trump at the White House led the U.S. president to put the summit back on for June 12 in Singapore. At that first summit, Kim committed to work toward “complete” denuclearization of the Korean Peninsula in exchange for security guarantees from the U.S. But the deal’s implementation has stalled as the U.S. demands verifiable steps toward denuclearization and the North an easing of sanctions against the regime. Trump earlier said he expects to meet Kim Jong-un after the U.S. midterm elections on Nov. 6, in one of three or four locations. The State Department declined to confirm that a meeting between Pompeo and his North Korean counterpart will take place. “I think what the secretary said, he would be speaking to his North Korean counterpart. I have no further details to provide about how that speaking to his counterpart will take place — where, when, et cetera,” department deputy spokesperson Robert Palladino said during a press briefing.